There are no hard and fast rules when it comes to weaning your child from breast milk or formula: they each approach this big step at different times, and in varying speeds and frequencies. But sometime in that first year of exponential growth your baby will be ready to try some solid sustenance. Here are some tips for fostering a life-long love of good food. Transitioning to solids too early can contribute to creating food sensitivities, as a baby’s GI tract is immature and still forming—hence the need to watch and wait for your baby’s cues. 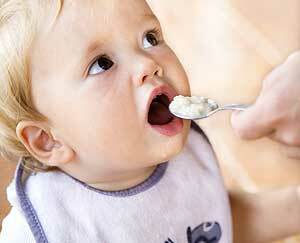 Before 6 months of age—Experiment with bananas, rice cereal, pears, and applesauce. 7 to 9 months—Introduce peaches, carrots, squashes, avocadoes, and mashed potatoes. 9 to 12 months—Try egg yolk, cheese, yogurt, yams, oatmeal, peas, beans, noodles, poultry, and rice cakes. 12 to 18 months—Bring papaya, apricots, grapefruit, spinach, cauliflower, melon, kiwi, whole milk, whole eggs, and fish to the table. Rotate foods to keep them interesting. If your baby takes a liking to string beans, avoid giving them a green bean–only menu for weeks on end. Offer up some raspberries and sweet potatoes or blueberries and squashes. Steam, rather than boil, food to preserve its nutrients. Puree, in the earlier stages of weaning, as babies initially need a mushy, soft texture. Whether you are making your own baby food or purchasing food, avoid added salt and sugar as you want your baby’s diet to be as simple and unprocessed as possible. Find the best-tasting produce by offering what’s in season: In the hot months, try summer squash, green beans, raspberries, blueberries, peas, apricots, and peaches. In cooler seasons, try winter squash, carrots, and yams. Easy applesauce—Whip up a quick applesauce for baby by peeling, coring, and seeding several apples. Chop into small pieces and place in a saucepan with about an inch of water above the top of the fruit. Let the mixture come to a boil and then turn the heat to simmer. When fruit becomes soft and yields to a fork, remove from stove and let it cool. When amply cooled, use a food mill or strainer to run apple mixture through. You can also blend in a blender to get a smoother sauce. When a baby has made it clear she wants to eat, introducing single foods is a good way to start the process. Offer green beans at one meal, and see if your baby enjoys them. Watch for any skin or diaper area reaction. By focusing on single foods, you can more easily zero in on possible food sensitivities or allergens and learn which foods to avoid. Steer away from the common allergens shellfish, soy, nuts, eggs—and also honey, due to risk of botulism. Regardless of what you offer your baby, make sure it's presented in small servings in small sizes. Cut, slice, or mash finger foods to make them as small and easy to swallow as possible. Wash fruits and vegetables well. Remove pits, seeds, peels or anything that could cause choking. Avoid “chokable” foods such as raw carrots, raw apples, grapes, unripe pears, stringy foods, nuts, seeds, popcorn, and hard beans. Kathleen Finn is a freelance health writer in Portland, Oregon. Her daughter was slow to embrace the joys of eating, despite the ice-cube trays of homemade baby food that stood at the ready in her mom's freezer.